02 Oct Escape One Traveler Tiny Home at Sacramento Home and Garden Show at Cal Expo – October 12 – 14, 2018! Escape One Traveler tiny home is an organic, natural, zen tiny home. From the ancient Japanese shou sugi ban pine exterior to the soaring airy interior, ONE feels quiet, traditional and timeless with the flexibility to be used dozens of ways. 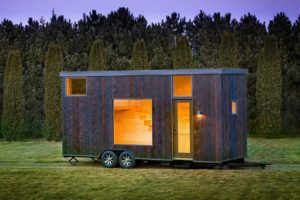 “One” is approximately 276 square feet including the second floor and is 30′ long including the trailer hitch. Don’t miss this exciting opportunity to see this special tiny home. Enter the Blue Gate off Exposition Boulevard. The Escape One Traveler tiny home will be located outside in front of the Pavilion building at Cal Expo. Gate opens at Noon on Friday, October 12th!